Natalia said: "Being on a cycling trip visiting many places in Lithuania and exploring Vilnius made me visit several shops and small stores in the capital. This beautiful and cozy place, where the city center belongs to the UNESCO, is full of timeless shops. One of it was MINT VINETU - a bookstore which made me stop for a while. The store was divided into two sections, one offering Lithuanian books, other English books. Friendly atmosphere was also created by comfortable seating and an English speaking young fan of second hand books watching 'How I Met Your Mother'." 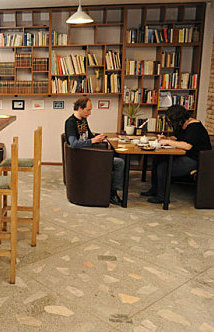 Mint Vinetu is certainly a specific bookstore, with specific crowd, stock and services. The name also reveals that Mint is also about tea, which you can sip while reading your books, even if it is cinnamon over mint that you prefer. We haven't, however, been able to solve the mystery behind the presence of Vinetu (Winnetou), the legendary last chief of the Mescalero Apaches tribe immortalized in the books of Karl May, in the name of the bookstore. Yet he is there, also embellishing the logo of the store. "Mint Vinetu is a bookshop of used books, where good people meet", as is stated on their website. This bookstore specializes in secondhand books in both English and Lithuanian. but they offer a selection of titles in Russian, German, French, Italian, Spanish or Polish as well. The selection, people argue, may be small but it's "best anybody's managed to do so far" is what one review said. The prices of English books usually range from 3 to 5 EUR, though some more expensive pieces can be found. 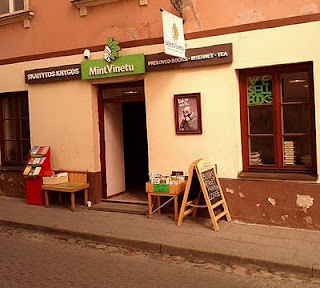 The friendly staff will also buy books from you, if you are willing to sell, that is - travelers passing through Vilnius can use this opportunity to exchange the books they've read and get a 50% discount in Mint Vinetu. What is also interesting about Mint Vinetu is that several months ago they launched a campaign, titled Become Someone Else, which became ubiquitously known for its originality. You can check it out HERE.